For many families, the summertime brings change, and with that can come stress. Many times, stress can be positive—but it’s still stress. When the body experiences stress, it releases the hormone cortisol, which breaks down fat stored in the body and converts it to fuel (blood sugar) the body can use to fight or flee. However, most of the time the body doesn’t actually need this fuel, and the higher level of blood sugar can lead to health issues down the road. Managing stress is incredibly important to not only our physical bodies, but to relationships with ourselves and others. Read on to learn some stress management tips! Albemarle Squre Family Healthcare is a Charlottesville primary care office that provides care for the body, as well as mental healthcare. Whether you’re looking for ways to manage stress better, want to discuss an issue that’s causing you concern, or have another mental healthcare issue, please give us a call. Our team of experienced doctors and nurse practitioners is ready to help you. Contact us today to make an appointment. 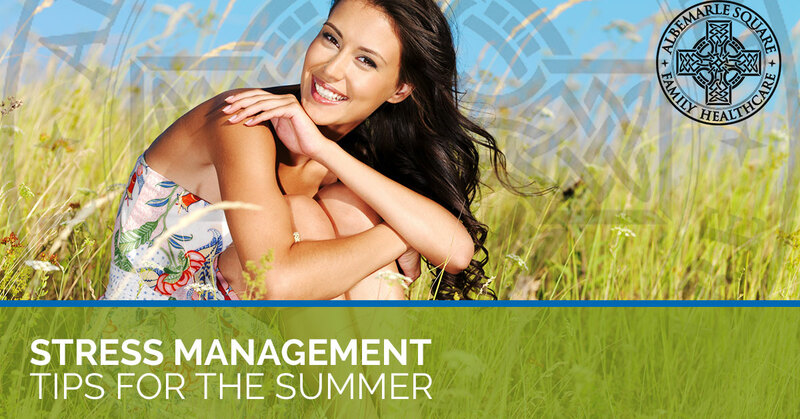 Here are some stress management tips for your summer! There’s no doubt you deeply love your family and enjoy spending time with them. However, if you’re in a car together traveling for long periods, or there’s a big family gathering, that together time can become overwhelming. Taking time to yourself and giving yourself permission to take a break are okay to do. Even if you take 30 minutes to lay down in the thick of it all to close your eyes, meditate, or listen to music, that can be just what you need to relax and come back with a fresh perspective. We all look forward to the day where the last bell of the school year rings and the kiddos are home for the summer! That said, it will definitely change things in your schedule. Kids crave routine, and are very much in need of structure year-round. Begin their summer by establishing a routine for the weekdays and weekends, and be sure to schedule some fun time in there, too! You’re likely going to be eating differently if you’re headed out for a vacation, so getting enough exercise is more important than ever. For one, because eating on the road is usually not as healthy as what you might normally make at home. And two, because if you’re driving or flying, you’ll need to balance all those hours of being sedentary. Exercise is an excellent way to burn off stress and wind down, whether you’re doing yoga, high-impact interval training, walking, or anything else. Make it a priority to get up and move at least once every hour if you can! Meditation is a fantastic way to wind down and achieve new levels of relaxation. It does take practice to get into a meditative state, so start small and work your way up. Not sure how to start? You can find meditation practices on YouTube, Spotify, your phone’s app store, and at the bookstore to get your practice underway. When you find that your stress levels are climbing, take a 5-10 minute break away from the activity around you and meditate to achieve the inner calm that you need. We hope that these stress management tips have been helpful! Albemarle Square Family Healthcare is dedicated to providing not only physical health and wellness care, but also mental healthcare. When you and your family need Charlottesville primary care and more, give us a call to make an appointment!